Leader of Opposition in the Lok Sabha Sushma Swaraj today said that Gujarat Chief Minister Narendra Modi was fit to become the Prime Minister of the country. Leader of Opposition in Lok Sabha Sushma Swaraj addresses a public meeting in Vadodara on Saturday. The mortal remains of former Prime Minister Inder Kumar Gujral, who died at a hospital in Gurgaon yesterday, were consigned to the flames amid state honour near Smriti Sthal here this afternoon. 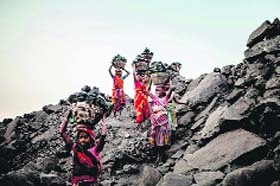 Cracking the whip for the first time on the public sector undertakings (PSUs), the government has sent notices for de-allocation of coal blocks with the Chhattisgarh Mineral Development Corporation Ltd and Odisha Mining Corporation Ltd besides deducting the bank guarantee (BG) of the former. Weeks after two girls from Palghar on the outskirts of Mumbai were arrested for criticising the state-wide bandh to mourn the death of Bal Thackeray, a spate of fake Facebook profiles is causing confusion and agony to the people in Maharashtra. The Congress is witnessing a flurry of activity as it gets battle-ready for the major electoral challenge it faces in 2014. After the "samvad baithak" held in Surajkhund recently for greater coordination between the party and the government, the Congress will organise a "chintan shivir" in Jaipur next month to introspect about the party organisation's weaknesses and draw up the broad contours of its poll strategy. Former Karnataka Minister and mining baron G Janardhana Reddy, lodged in an Andhra Pradesh jail in connection with an illegal mining case, is all set to contest the Assembly elections in Karnataka due in May next year on BSR (Congress) ticket. After the Bandra-Worli Sea Link, Mumbai is all set to get another similar structure. The proposed sea link over the Arabian Sea will connect Bandra to Versova in the suburbs and is expected to provide seamless road connectivity between downtown Mumbai and the suburbs. The Gypsies of Europe or Romani people have an Indian genetic connection. 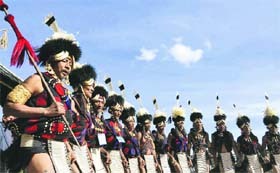 A new study by an international group of scientists led by the Hyderabad-based Center for Cellular and Molecular Biology (CCMB) concluded that the aboriginal scheduled tribe and scheduled caste population of north-western India, traditionally referred to as Doma and also Dalits, are the most-likely ancestors of modern European Romas. Chief Minister Akhilesh Yadav today ordered a magisterial probe into the reported ‘honour killing’ of Bulandshahr’s Abdul Hakim who was gunned down in broad daylight near Aroli village on November 24. The hearing on the bail pleas of Zee Group editors, accused of attempting to extort Rs 100 crore from a firm of Congress MP Naveen Jindal, was deferred today by a Delhi court to December 3 due to absence of the public prosecutor (PP) and the investigating officer (IO). External Affairs Minister Salman Khurshid has written to his US counterpart Hillary Clinton for extradition of Pakistani-American LeT terrorist and Mumbai terror accused David Headley and his accomplice Tahawwur Hussain Rana. Leader of Opposition in the Lok Sabha Sushma Swaraj today said that Gujarat Chief Minister Narendra Modi was fit to become the Prime Minister of the country. "Narendra Modi is capable of becoming the Prime Minister of the country... he is fit for it," Swaraj told reporters at the airport, responding to a query. Swaraj arrived here for campaigning and will be addressing two rallies of which one will be in Vadodara while another at Dabhoi town. 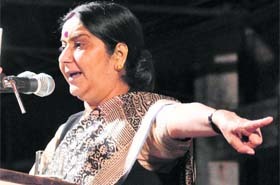 "The BJP will make a hat-trick by winning the Gujarat Assembly elections for the third time in a row," Swaraj said. She also said that "The Congress will be defeated in the parliamentary election scheduled to be held in 2014". Meanwhile, Gujarat Chief Minister Narendra Modi today launched the final leg of his campaign for the Gujarat Assembly elections after offering prayers at the famous Somnath temple at Veraval. "They (Congress) will face the worst defeat in Gujarat. The entire country is being crushed under the sins committed by the Central government," Modi said outside the temple. "Congress' misrule, corruption, inflation and neglect of the common man will result in a thumping victory (for the BJP)," he claimed. Later, addressing a rally in the town, Modi alleged, "The Congress has no concern about development. It believes only in divide-and-rule policy. "In the last general election, of 2009, the Congress had promised to reduce inflation in 100 days, but it has failed to do so even after more than three years." Gujaratis had “buried” Congress' vote bank politics and embraced BJP's development politics, he said. Gujral’s elder son Naresh Gujral, a Rajya Sabha MP from Punjab, lit the pyre. Vishal Gujral and Anishchay Gujral, the younger son and grandson, respectively, of the deceased PM also took part in the rites. The well-attended funeral, which had people from all walks of life, was attended by President Pranab Mukherjee, Vice-President Hamid Ansari, Prime Minister Manmohan Singh, AICC chairperson Sonia Gandhi, Union Home Minister Sushil Kumar Shinde, Defence Minister AK Antony, Union Commerce Minister Anand Sharma, Law Minister Ashwani Kumar, Farooq Abdullah, Former Union Minister Jaipal Reddy, senior BJP leaders LK Advani, Arun Jaitley, Chief Ministers of Punjab and Haryana Parkash Singh Badal and Bhupinder Singh Hooda respectively, SAD MP Sukhdev Singh Dhindsa, INLD chief Om Prakash Chautala, LJP’s Ramvilas Paswan, JD-S’ Danish Ali, Amar Singh, Rajya Sabha MPs Mohammad Adeeb and HK Dua and a few foreign dignitaries. The body was consigned to flames amid prayers and a 21-gun salute carried out by the armed forces. Among others who paid their respects to the departed soul were the Chiefs of three armed forces. The coffin, wrapped in a Tricolour, was brought to the funeral ground at 2.23 pm in a flower-bedecked gun-carriage in which his family members also stood. The convoy carrying Gujral’s body had left his official residence — 5, Janpath — at 1.25 pm. A few dignitaries, including the Prime Minister and his wife, Lieutenant Governor of Delhi Tejendra Khanna, Leader of Opposition in Lok Sabha Sushma Swaraj, Ashwini Kumar, Tarlochan Singh, Milkha Singh, senior journalist Kuldip Nayar, Supreme Court Judge DK Jain and BJP leader Ananth Kumar, paid their last respects to the departed leader at his official residence in the morning. The last prayer meeting will be held from 4 pm on December 3 at Gujral’s official residence. In the letters sent to the two PSUs, which were part of the group of the PSUs, which presented their case before the Inter Ministerial Group (IMG) on coal in October, the Coal Ministry has informed them that the coal blocks allocated to them were being taken back as their had been inordinate delay in the development of the mines and that the two PSUs would not be eligible for of a coal block in lieu of the de-allocated coal blocks. The Coal Ministry has de-allocated the Shankarpur (Bhatgaon-II) and Extn and the Utkal-D coal block allocated to M/s Chhattisgarh Mineral Development Corporation Ltd and M/s Odisha Mining Corporation Ltd, respectively. As per the recommendations of the IMG, the government has also given orders for forfeiting of the BGs to the extent of Rs 1.59 crore of Chhattisgarh Mineral Development Corporation Ltd. The IMG had recommended the de-allocation of the coal blocks to the two PSUs at its meeting held on November 5. The two had made presentations regarding the coal blocks allocated to them to the IMG on October 9 last. In its letter to the Chhattisgarh Mineral Development Corporation Ltd, the government said that the IMG noted that no clearances had been taken by the PSU nor has any land been taken in possession after elapse of three years since approval of the mining plan in 2009. A total of 58 mines were issued show-cause notices for their failure to develop blocks within stipulated timeline. Of these, 31 mines were with the PSUs. Last week, the Palghar police picked up Sunil Vishwakarma, 19, after some activists of the Maharashtra Navnirman Sena complained to the police about posts that made disparaging remarks about party leader Raj Thackeray. Unlike in the case of the two girls, the Palghar police did not arrest Vishwakarma. Instead, they questioned him and his family after which it turned out that the Facebook account was actually created by some unknown persons. 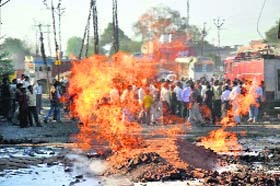 "The cybercrime cell of the state police is investigating the incident," an officer of the Palghar police station said. Subsequently, the Mumbai police asked citizens to complain about fake profiles and cases where their accounts on social networking sites had been hacked in order to avoid inconvenience. The appeal resulted in several complaints by people whose accounts had been hacked or whose identity was ‘stolen’ by unknown persons. "Identity theft and impersonation amount to crime and can be punished under cybercrime laws," a police officer said. According to the police, a third case of cybercrime was also reported from Palghar. The editor of a local newspaper in his complaint said that a fake account in the name of his newspaper was opened on Facebook and abusive content related to Bal Thackeray was posted on the page. Following the complaint by Mohammed Hussain Nadi Sarwar Khan, editor of the Palghar Mirror fortnightly, the page has been blocked, the police said. Today, none other than Raj Thackeray's MNS filed a complaint before the police alleging that a fake account was created on Twitter in the name of Thackeray's son Amit and some objectionable comment on Babasaheb Ambedkar was posted on it. MNS officials filed the complaint with Joint Commissioner of Police (Crime) Himanshu Roy who forwarded it to the Cyber Crime Cell for investigation. According to an MNS spokesman, the post was noticed by some party workers who are active on Facebook and the matter was brought to the notice of the leaders. In a statement issued here, the MNS said no member of Raj Thackeray's family had accounts in either Facebook or Twitter. “Some people are playing mischief through social networking sites. We appeal to people to not believe in any rumours spread through these social networking sites,” the statement read. The police said they were now looking at the possibility of mischievous elements using social networking sites to stir up trouble in Maharashtra. AICC general secretary Janardan Dwivedi today said the three-day meet will be held in the Rajasthan capital from January 18-20. While the shivir will be held on the first two days, the issues and suggestions thrown up during these deliberations will be placed for a larger discussion before an AICC meeting on the third day. Dwivedi said the meeting will review the current political and economic situation and also discuss the government's schemes for rural and urban areas. The proposed chintan shivir has its task cut out. Congress cadres are a demoralised lot after the string of electoral defeats they faced in the past year. Moreover, the party's support base is being eroded in several states while most of its state units are in the thick of internal squabbles. Even as Congress credibility has hit a new low, the UPA government's popularity ratings have slid in the face of corruption charges and poor governance. But the party and the government are fighting back. While the pace of decision making in the UPA has picked up speed, the Congress is also putting its house in order. The two demonstrated they are on the same page when the party endorsed the government's reforms agenda at a public rally. The UPA recently unveiled its new flagship programme, the direct cash transfer scheme, as its next poll plank and the party constituted a special coordination committee, headed by AICC general secretary Rahul Gandhi, to prepare for the 2014 Lok Sabha elections. The last chintan shivir held in Shimla in 2003 had proved to be a turning point as it set the stage for the formation of the Congress-led UPA the following year. It was at the Shimla meet that the Congress shed its earlier inhibitions on alliances and took a clear position that it should join hands with other secular parties in its battle against communal forces. The party's Panchmari chintan shivir held in 1998 had been ambivalent on alliances. It is to be seen if the Jaipur meet gives any fresh direction to the party. The Congress president spoke about holding a chintan shivir in her address at the 2011 Burari AICC session but the plan could not fructify earlier as the party was busy with elections and fending off corruption charges. Sonia Gandhi told the party top brass at the samvad baithak recently that the issues flagged by them regarding organisational ills, party's future programmes and poll strategy would be discussed in detail at the upcoming chintan shivir. Janardhana Reddy was arrested in September last year by CBI in connection with the case. "Janardhana Reddy will contest next Assembly polls as candidate of Badava Shramika Raitha Congress BSR (Congress) either from Bellary, Kushtagi or Chitradurga constituencies. He is yet to make a choice from where he would contest," Bellary MLA G Somashekara Reddy, brother of Janardhana Reddy, told reporters here. Somashekara Reddy said BSR (Congress) president B Sriramulu would soon send in an affidavit to the CBI in this regard. "We are confident that Janardhana Reddy will contest the election because people remember him as a "good" person. He is a victim of political conspiracy," he said. Sriramulu had visited Janardhana Reddy on November 28 in Chanchalaguda Central Prison in Hyderabad and discussed about the elections, he said. According to the Maharashtra State Road Development Corporation that will develop the sea link, the project received clearances from the Ministry of Environment and Forests last month. "We will begin work on the project as soon as the Maharashtra sub-committee on infrastructure gives the green signal," a MSRDC official said. The proposed link will be 10 km in length and will be constructed 900 metres from the coast line. It will have eight lanes, thus allowing faster dispersal of traffic, according to the MSRDC. The agency has estimated that the sea link will be constructed in three years' time at a cost of Rs 4,000 crore. In the past few weeks, the agency has been working hard to placate fisherfolk living along Mumbai's coast, who fear that the link could block their access to the sea. At least four major fishing villages are located on the coast along which the proposed bridge is to pass. The MSRDC has mooted navigational spans of 100 metres in some areas so that fishing boats can pass. In Bandra, however, the spans will measure 50 metres, officials said. Among the features of the proposed sea link is that part of it will have to be constructed on stilts to prevent destruction of mangroves. However, the MoEF has been told that 150 sq mtr of mangroves would be lost permanently while 50 sq mtr of mangroves would be lost during construction of the sea link. The team, led by CCMB scientist Dr Kumarasamy Thangaraj, conducted what is claimed to be the first ever scientific study of the origin and genetic history of Roma population. “We have been able to crack the mystery surrounding the origin and migration of the Roma population. The ancestors of this wandering tribe could have migrated from India about 1,400 years ago,” Dr Thangaraj said. The study analysed the Y chromosome samples of over 10,000 men to establish the genetic signature of ancestor Indians among the Gypsy population. The origin and migration of the Roma across the world has been a mystery so far. Though the linguistic and genetic studies of European Roma have traced their origin to Eurasia, the exact parental population group and time of dispersal has remained an unsolved puzzle. Dr Thangaraj’s team traced the founder of the European Roma using the Y chromosome genetic signatures. There is no archaeological evidence about the origin of the Roma, and even historical documentation is scanty. The research therefore focused on genetics. The conclusions have been arrived at after an exhaustive study involving screening of about 10,000 males around the world, including 7,000 hailing from 205 ethnic population of India to discern a more precise ancestral source of Romani population. Dr Thangaraj said that all males of a family or a population evolved from a single founder make and would possess the same Y chromosome. Based on the genetic signature that exists on the Y chromosome, every male could be assigned to a specific group (haplogroup), enabling tracing of parental lineage using these signatures. It was shown that the European Roma possessed the Y chromosome haplogroup Hlala. The most recent common ancestor of European Roma was not identified because of the absence of similar data from their putative homeland, India. “We have compared the worldwide phylogeographical (study of the historical processes that may be responsible for the contemporary geographic distributions of individuals) data for Indian Hlala haplotypes with Roma and concluded that Doma are most likely ancestral populations,” the scientist said. The origin and migration of Romas across the world has been mystery so far. Minister of State for Khadi and Village Affairs Riyaz Ahmad who visited Bulandshahr and spent time with the widow, Mehwish, and the family of Hakim also announced a compensation of Rs 5 lakh on behalf of the state government. With the arrest of the fifth accused, Malik, from Chola railway station today, all the culprits in the case are now behind bars. The prime accused Salman was arrested on November 29. Hakim had to pay with his life for marrying Mehwish in 2010 against the wishes of their respective parents. She was from Aroli village. The couple has an 18-month old child and was expecting their second baby. After being threatened by Mehwish’s family, the couple had fled to Delhi where they were living at a short stay home run by an NGO which offers protection to such couples who exercise their right to choice in marriage. Believing that their families had reconciled to their marriage, the couple had returned to their village a few months ago. However, on November 24 after Hakim got into a row with a man in the village, he had complained to the police against his attacker. While returning from the police station, Hakim was shot in the neck reportedly by the same man. The death of Hakim hit headlines as the couple had been part of Aamir Khan’s television programme ‘Satyamev Jayate’ where Hakim had spoken against the terror of khap panchayats. Following Aamir Khan publicly coming in support of the widow, the Central government was forced to seek report from the Uttar Pradesh government. Irked over the non-appearance of the two, Metropolitan Magistrate Gaurav Rao also asked a senior police officer to explain the lapse. “Why are the IO and the PP are not available despite a prior information from this court? Let, a written explanation be filed by the DCP concerned,” said Rao, adding the arguments on bail pleas of Zee News head Sudhir Chaudhary and Zee Business Editor Samir Ahluwalia would now be heard on December 3. The accused editors had filed a fresh plea yesterday after the rejection of their earlier plea and were remanded to 14 days’ judicial custody till December 14. The journalists face charges of extortion, the maximum punishment for which is an imprisonment of three years or fine or both and criminal conspiracy, which can lead to six months imprisonment or fine or both. Khurshid has written the letter to Clinton for extradition of the two before their sentencing there in January, official sources said here today. According to sources, India is hopeful that the US would take a favourable decision on its request which was sent in the first week of November. New Delhi is awaiting a response from Washington. During her visit here last month, US Under Secretary for Political Affairs Wendy Sherman had said India's request for extradition of Headley was under consideration and a decision could be taken soon.